Welcome to part one in my series on how to buy and sell blogs and websites for big profits. Let’s dive straight and look at why buying a blog or website is such a good strategy, especially given the challenges of starting something new from scratch today. Over the years I have taught A LOT of beginners how to make money via a blog (I’ve had over 3,000 paying members in my blog coaching programs). These people are new to blogging and internet business, and have a strong desire to create an online income stream. There’s nothing wrong with this path. I’ve done it more than once with my own blogs and websites. The rewards can be tremendous, but the path is long, often lonely and depressing if you do it without help, and you are never certain of success. You need a very strong mindset and belief in yourself to keep going, especially if you want to make money from your project. It’s challenging because of the slow pace and ambiguity of results. You’re working very hard, yet no one is reading your work and you are certainly not making any money yet. From my own experience I feel a whole lot more successful when I’m making money. It’s nice that people read my writing, leave comments, share my work – but if I can support myself and my family because of my work, that is an incredibly satisfying feeling. The great thing about starting a blog or website from scratch is the learning process. The downside is that a lot of the learning during the early months and even years is done in isolation. It’s a slow process, and until you have an audience it is hard to determine conclusive results. When your audience size is small and no one is buying from you, how can you really know if a technique works or not? The best learning comes when you have an audience who buy things, because your experiments impact people who give you live feedback and make a statement by how they spend their money. Momentum is critical. If you are responsible for creating momentum from a standing start, you certainly have your work cut out for you. Would You Like To Skip The Slow Part? Consider this alternative: You buy a blog or website that already has traffic and makes money. Not everyone has the capital to buy a blog, but if you can collect together $500 to $1,000 that’s enough to get started. If you have $10,000 to invest you can buy a blog or website that returns as much as $1,000 a month. The mind really begins to go to interesting places when you think about buying more than one site. Buy two or three sites that collectively bring in $2,000 to $3,000 USD a month and you just bought yourself a ticket to a full time income living a quality lifestyle in a country like Thailand. Keep going and your little portfolio might become your most significant cash flow source. Let’s not forget that putting together a portfolio of sites gives you an asset that is sellable. A six figure or even million dollar payday is possible if you build up a quality portfolio of websites and then sell them. For a beginner who wants to fast-track the learning process buying a blog is by far the best option. 1. You can buy a blog that has traffic: The website already has an audience who keep coming back for more, and new visitors who arrive each day from search engines. 2. You can buy a blog that makes money: The money might come from advertising, sales of an affiliate product, an information product like an ebook or course, a subscription service, software, or physical goods. The point is people are already spending money and you get to take over that income stream. You might even buy a site with MULTIPLE income streams already, or the potential to expand into multiple income streams. The best thing about buying a website is you don’t have to worry about picking the right niche. You don’t go through that depressing early stage when you produce amazing articles or videos and no one even knows your content is there. From day one people will see your work. From day one you have a platform you can build on. From day one you have people who spend money on what you offer. Plus you can CHOOSE what niche you buy into. You can see what topics the website covers, what they sell, how they make money and then decide if it’s the kind of blog or website you could see yourself taking over. You can also choose what type of income streams you want. If you’ve always wanted to own a money making membership site, you can buy one. Maybe you want a blog with hundreds or thousands of readers. Buy it! 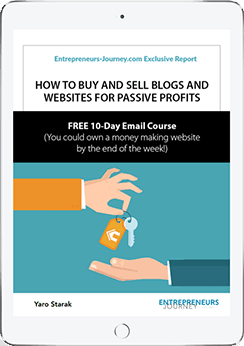 This strategy offers a pretty amazing jumpstart, and it’s a real possibility if you just take the time to buy a quality blog or website. I can promise you this – it will take a lot less time to find a quality blog you can purchase, than it will to create one from scratch. That’s the power of money. It doesn’t have to be a lot, but if you have the capital, it can fast-track your results. Before you buy a blog or website you do need to be careful and follow a due diligence process. You must know how to spot a “lemon” – a website that might look good on the surface but is actually a very bad site to buy. To provide you with the knowledge to get started, I have written a concise, step-by-step guide with case study examples. It’s literally all you need to get out there and buy your first blog or website. Make sure you check out the free samples in the sidebar on that page so you can see exactly what you receive inside the package. Next in this three part free series I am going to explain how buying another blog or website is a great way to expand your existing business. It’s like corporate mergers and acquisitions, but you don’t have to be a big company, you can buy something that meets your current needs and budget. You can also go express to part three in this trilogy of training articles, where I explain how I sold my online proofreading business for $100,000 (which was just a website and some contract editors). During the years after I sold my proofreading site I was under a non-disclosure contract, so I couldn’t write about the sale in detail. Now that period has lapsed, I can reveal what happened. I know you will find the behind-the-scenes details very interesting. Good luck finding your first blog or website purchase! I’m a critical mind – you could call it a negative one – and when I see reward without risk, alarm bells start ringing. I see one obvious risk: you buy the site at too high a price. I guess you will write about that next. Probably it goes the other way round: first you need to know how to produce quality articles for the acquisition. And even then the audience may not like you. I’d prefer creating my own blog by far and large. So what am I missing here? “Stay tuned” is just as good an answer. Yes spot on – those are concerns I have had – and still have when buying a site, in particular a blog. Like all investments there is risk, which is why you should start small to begin with and factor in the chance that you will lose all your money. It’s not likely, but possible. My first purchase of a blog was $2,000. Next I bought some sites for $12,000. Later I made a bid for $50,000, which I was willing to pay at the time, but was outbid (it hit $100,000, over priced in my opinion). The point is I gained in confidence through experience and was willing to spend more as I learned what happened after you take over a site. With a blog I think the risk is not so much the personality factor of the previous owner. It’s what Google does. Most blogs will continue to receive traffic from search engines to old blog posts, which means despite the change of writer, the site traffic actually doesn’t change. This was my experience with EJ when I experimented with the multi-author model when new authors came on board three years ago. The traffic stayed mostly the same. I was hoping for an increase given the increase in content production. What ended up happening is the additional authors kept the status quo of new content for the regular repeat audience and Google sent me pretty much the same traffic, with a large chunk of it going to articles in my archives that rank well (and still do today). What you are really buying when you purchase a blog is the platform of previous content and search traffic to it, and the attention that the repeat daily visitors give you. It’s those repeat daily visitors you have to try and convince to stick around after you take over. The search traffic should keep coming, barring anything Google does – that’s a risk we all face as website owners who depend on Google. Keeping a blog going after you buy it is not that hard, as long as you put a content strategy in place immediately. You don’t necessarily have to of course, you could just let the blog sit there and make money from the existing search traffic, but it will start to decrease. As we know, blogs need updating to maintain their position. My experience when I took over a second blog was no major downturn in traffic at all, but I did write to the blog straight away introducing myself, and continued to publish new content. Then I brought on volunteers writers to take over from me (this is all covered in the e-guide package). It worked brilliantly, and I believe is an outsourcing strategy that can work for any blog, as long as you continue to source and publish quality content. That is definitely easier than building something from scratch and I honestly believe the risk is marginal compared to the risk of spending 12 months writing a blog that does not take off at all. That’s a much higher opportunity cost. Your situation, do you have money to spend, do you want to take over something you didn’t create yourself, all factor into this kind of decision. I do think people need to take the buying a site option more seriously – so few people do it. And yes, I will have more on these subjects coming up next week, or just grab my e-guide package for the all the details. For now I am off to bed, good night! What a great idea! Buy a blog do it up then resell! Awesome I love it and it makes complete sense to me! Before I started blogging though I was sceptical and wanted to protect my money and wrap it up in a blanket but since reading ‘How Rich People Think’ I have changed my mindset and I take calculated risks. I built a website back in January for Birders and Birdwatchers. It’s a bespoke social network that I have coded from scratch which to my surprise gained a GR of 3 within 2 months of purchasing that domain even with hardly any promoting of it! Basically it was just an exercise to see if I could make a social network of my own. So now I don’t have the time to run it I am actually thinking of selling it. What would your thought’s be on that? or should I keep it and continue to develop and promote it? Looking forward to your book Yaro will purchase it when I can and once again a great post! That’s a tough question for me to answer because it’s really about where your motivation lies. Do you want to put in the work on this website to grow it? Based on your inaction over the previous months, there must have been something else you preferred to do rather than work on the site, so perhaps that is a reflection of how you feel about it? In terms of selling it, that is always an option. How you can get for it is a factor of the traffic and income, if there is any. Good luck with your decision Phillip and I hope you enjoy my e-guide package. Yep I see what you mean there Yaro. I may just keep it and keep building it as I don’t thinks it’s worth a lot of money anyway and is getting very little traffic. At the moment though I am just concentrating on building my new blog up which I am highly enjoying even after what you have said here! I am just going to renew it for another year and see how I feel over time! Loving your Blog Profits Blueprint book Yaro! I was thinking of making one myself as have been blogging for nearly 2 months and have 21 posts already, so perhaps it’s time hey! Looking forward to your next post dude! Personally I would be grateful of having a website and therefore instead of focussing on other websites, why not brainstorm your options with this one such as changing the theme or asking your current followers/subscribers what they want out of that website next? It is really great idea for buying a blog and reselling it. I am not sure how can i buy a good blog and how to manage it after I get it. Therefore, I am now waiting your e-book so that I could learn from your experience. Great post and I’m sure this will be another successful product. To share my experience – earlier this year, I thought that buying websites would be a jump start into the online business world. I spent £1500 for two highly ranked sites in the niche plus several other domains. The site had good traffic and was profitable and after handing over the money the site owner gave me admin rights to the sites – ie I could update them and place my affiliate links and Adsense codes on the site – but kept promising to transfer both the hosting and domain which he never has. Twice the sites have gone down due to him not paying the monthly hosting fee and one of the domains has expired. I guess lessons learnt the hard way but this has not put me off as I can see the huge potential of creating a passive income buying existing sites. It is definitely a case of buyer beware in this field and do as much work as possible to smooth the transfer of a site. Thanks for the mini-case study Nick. This is another reason why I strongly suggest doing the 50% upfront and 50% after transfer process, to make sure you get complete access to everything. One of the topics I cover in my e-guide is what you need to remember to take over when you buy a site. Obviously the hosting account, or transfer the site to your hosting account, the domain name, and any software licenses too. In each deal I have done I spoke live via skype with the person I was buying from and made sure we maintained an ongoing dialogue for several weeks after everything is done. This is important because on several occasions there has been a software license we forgot to transfer and I needed their help after the sale. This is also a good tactic because talking over the phone gives you a good indication of what kind of person they are. If they are not friendly and making it hard to find information from, it might be time to stop the deal before it even starts. Good luck finding a new site to purchase Nick! Can you be sure of the income the blog you´re thinking of trying to buy has been making? You can never be 100% sure Robert, there is always a risk. That is why I use techniques like the 50/50 method, paying half upfront, then taking ownership, and paying the second half after I see the traffic and income coming in for a month. This is especially important on the bigger deals. You can’t always get this, but it’s worth asking about when you buy a site. Asking for income reports from things like Google AdSense, Clickbank, Paypal, etc definitely helps. These can be faked (Will Swayne, one of the people I interviewed for the e-guide, explained how someone went to odesk to have the reports edited to inflate the numbers – he didn’t cover up his tracks very well though so Will easily found out with a Google search). I have yet to have this problem however and I think it’s easy to spot the dodgy sites just based on the language used when communicating and getting a feel for what numbers a site should report back (if it’s too good to be true, then something is fishy!). In the end you just have to take a leap when you make your first purchase and you will gain in confidence from what you learn from there. I’ve been trying to start a blog for a while but have had problems with starting it. I think buying a blog may overcome a couple of them. However, How can you tell the difference between a spam and something legit? Also should you look for sites which provide business plans, content strategy reports, marketing strategy reports, etc? It’s usually quite easy to spot a spam blog if you due proper due diligence. The first place to look is Google Analytics data. If you can get direct access, which usually you can if you are working with someone serious about selling, you will see the actual traffic figures for as far back as they have had Analytics running. In the last few months I’ve been investigating four different sites for sale and every one of them has offered me direct access to traffic data, so I am very confident they are not spam sites. You can also look into the archives of the site and see what the content is like. Spam tends to stand out. There are many more things you can do during due diligence, all of which I cover in my guide. As for your second question – I don’t see any official “plans” nearly as important as reports on traffic and income. That is what matters most. Plans are completely subjective and have no impact on the current value unless there is real performance data attached to them. The product launched a few days ago Dion! I think you might need to explain what you mean more – it sounds like you are saying basically build small niche sites from scratch, but outsource the technical part, and then sell them? Or are you saying pay someone like you to build the niche sites for you, then buy them from you? I’ve never found someone who does that! So many people try building niche sites from scratch and it’s WAY more work and time to get traffic, make an income, plus frankly, it’s boring in my opinion. I like the idea of buying something that makes money – that’s point, skip the “building” part. There’s nothing wrong with the niche website thing that so many people do (You, Pay Flynn, Adam Short, etc) and I know some people love going through the process of creating sites like this from scratch, building one after the other, but personally I find it incredibly boring, as I know a lot of people do. Plus it doesn’t always work. Trying to build traffic for something you don’t care about is hard, but for some reason when you have something that makes money already, you are more motivated to keep it growing. That’s my experience anyway! When I do build something from scratch it’s usually a big project – an authority site I work on as my main business for years. That’s a different story of course, because I am looking to create something substantial, a real platform, rather than a small niche site. Haha, I like where you are going with this David. I’m already investing as an Angel in tech startups, and I would definitely consider putting some money behind a really good niche site builder, especially if I gained equity in the sites too. You’re late to the party. Empire Flippers already do this. I’m sure others do this as well. Buying into a site that’s already proven the market/niche definitely saves you some time/effort/energy, especially when you consider the fact that builders have a failure rate on all sites created. We have buyers that are always looking for sites to add to their online portfolio because they dig the niche, it helps them diversify, etc. It’s an interesting, emerging market for sure and there’s a ton of opportunity. I’ve been a fan of yours for some time. Once upon a time I was a member of your Blog Mastermind community. You’ve got me intrigued about flipping blogs. And, I’m wondering about something. If I buy a blog at the cost of 10 months of earning, can’t I just do nothing with the blog, or do as little maintenance as possible to keep the revenue stream at least constant, and make a return of 10% a month? I understand that people want to flip blogs to raise capital to buy and sell more blogs to get richer and richer but if I’ve got some money and I’m lazy is it a viable strategy to make a 10% monthly mostly passive return? The answer to your question is “maybe”. The question you are really asking is will a blog you buy keep attracting the same level of traffic if you publish ZERO new content after you take it over? In my opinion it’s unlikely to stay exactly the same for an entire year with nothing new. If all the current traffic comes to the archives of the blog, then theoretically, it could work out that way. You still have to be really careful because Google factors in update frequency in their algorithm, meaning that if your site seems to have died, it might rank all of your content lower. What you need to look at is where does the blog get traffic? If you know more about that, you will have a much easier time deciding what to do next. I would suggest if you buy a blog that does make money, rather than just sit on it and do nothing, if it returns 10% a month, use 5% of that to outsource content production. That will keep the blog going, potentially increase the traffic and income, and can leave you in a hands-off situation anyway. That’s what I did with SmallBusinessBranding.com when I was in charge of it, although it took a couple of months to figure the system out. I hope that helps Sol! Thanks, Yaro. I appreciate your insight. Here’s a thought. I have a parked domain name that is unused and would make a great web site, blog site, etc.. I have no interest in building the web page or authoring a blog but I would like to “lease it” to someone interested in doing the work and having access to a great domain name. The creative person gets access to an otherwise non-attainable domain name, gets to create content and generate revenue..but pays a “domain name leasing fee” to the domain name registered owner. Opinion? Already being done? I’ve heard people suggest something like this before Mike, but to be honest I’d feel pretty uncomfortable building an asset on something I don’t own. There would be nothing worse than creating a huge website with a solid brand identification with the domain name, and then the owner decides to end your lease and do something else with it now that you built up all that great traffic and credibility. Like in real life, it’s usually better to own your own home if you like control. Great to see you have put together another high quality product, well done! I have to say this product has come at a very good time as I am beginning to consider investing the earnings from my Mum’s blog. I’m looking for a project that I can invest some time into setting it up and automating to build a (mostly) passive income stream and then hopefully repeat the process. I believe I’ve had enough experience writing sales copy, creating content strategies and sales funnels to be confident in buying a blog. What I don’t want is for the blog to turn into a full-time job where I have to respond to customers, write blog posts, etc etc. So my question I guess is this: How difficult did you find outsource the article writing and customer service side of the blogs you built? Great question and great idea with reinvesting profits – that is what I did with EJ back during the period when I just started earning more than I needed to live off. Outsourcing content for a blog is not that hard, like with most hiring it’s all about the quality of people you bring on board. As I discuss in the e-guide, I had volunteers when I outsourced my second blog, which wasn’t perfect but did the job. The hardest part with volunteers is keeping them committed, but I knew this would be the challenge, which is why I hired a manager to chase up the authors and also hire new ones when required. Of course you are paying money for writers it’s easier to keep them motivated and attract quality content, assuming you pay a fair rate. What a fair rate is various from country to country. What I would do is before you buy any blog take some time to read over the archives and see how good the content is. Then you will get a feel for what level of talent you need to bring on when you outsource. My one big piece of advice to avoid it becoming too much work is hire a manager. I would even suggest hiring them first, because they can then help you do everything else from there. In one of the bonuses in the e-guide I talk about how I came up with an innovative way to reward my volunteer writers without paying money. It worked pretty well because it offered them more than just the usual form of exposure – I gave them real tangible outcomes for writing regularly. I would be interested to know where your mindset is regarding the multiple you are willing to pay. Also why you are focusing on flippa.com to find acquisitions, versus a website broker ? With the multiple it really depends on the type of site. For example there is a forum I have been bidding on that actually reports no income at all, however it did make $6,000 in a previous year from advertising. The current seller hasn’t gone after the advertisers for rebills, so the potential is there to make that money or more again, or perhaps less depending on the traffic. This kind of site I would consider spending $5,000 on even though it reports back zero income, because the potential is there. I might even push up to $10,000 if the traffic is there to justify it. As a rough rule though, I think anywhere from one to two years net profit is a reasonable ballpark figure, again depending on the model used by the site and how I can leverage it. I write more about this in the guide. As for brokers, I actually follow six website brokerages right now, which sell sites valued from tens of thousands into millions. I like Flippa though because there are more sites popping up and often cheaper sites too. I like spreading my investment money around, it’s more fun that way, rather than pour it all into one asset. That’s a personal preference right now. Hey Yaro! I’m a newbie to money making blog but not new of having a website… Just wondering how to know the blog you are going to buy has many visitors or has a lot of traffic or it’s already generating income. I know we can ask the seller but it’s good to find on your own. I’m just a plain web owner but not techy on the other hand. The best thing to do Ralph is ask for reports with data – Google Analytics for traffic (and ask for your Google account to be added to their Analytics as a viewer so you can view the data live), and for income – Paypal accounts, affiliate reports, shopping cart software reports, whatever they have. You don’t buy anything unless you have some good verifiable data. Very interesting article. There is something I wanna try out though that is similar. What if I wanted to basically buy just the traffic of this specific website to mine? As part of the idea of buying a website and making it better, my situation is that I already have a website that is similar to the one I want to acquire but I like my name and branding of my website better. My idea is to just buy the new website with all the traffic and audience, and then slowly merge that site with mine, over time. Like importing all of the posts from that site, and then finally just redirecting the domain to your own older site. That is definitely an option Yennan, but you risk losing some of the traffic flows that are unique to that website that may not come across to your website if you merge them. I would suggest you keep them separate and if you want to merge anything, have the traffic all merge on to one email newsletter. That’s the tactic I would use. Just wondering, why you are focusing on marketplace (like Flippa) to find internet businesses? Have you never worked with Internet M&A Firms or Internet Business Brokers? I’m on the lists of about 6 brokers yes Jennifer, although right now I’m not doing a lot of buying and selling, I am focused on my teaching business. I cover brokers in the guide too, including an interview with one. Just off the top of my head; and harkening back to some of the previous comments about building portfolios…. What about a more organised approach? This is what I can imagine…. – Experts on blog / website buying (valuation etc)…basically the stuff you and others have done, Yaro, who have enough experience to be able to quantify at least part of the process (and have the art form down as well). Basically, one, two or a few people who have proven themselves at buying / selling sites for profit. In this business, obviously this person / these people are responsible for making the valuation to present to the “board” (who needs to look at current finances, risks etc to see whether to go ahead or not). This person / team could use VA’s with a basic, systematic / quantitative list. e.g. Provide daily a list of sites for sale that meet these basic criteria. The VA’s can do the grunt work of looking around and contacting sellers for further info etc to provide the list. – After the valuation has been provided, then the finance side needs to be looked at. Is this an appropriate purchase right now? e.g. There’s no point buying a golden opportunity for 100k if that’s going to use all the funds. This could be other people, or this could simply be a constitution of what rules will be followed. – Once an opportunity has been (a) identified, (b) “raw” valued, (c) re-valued in several ways (based on various future opportunities for improvement) and (d) checked against policies (diversification in number of sites, in number of niches, maximum % of portfolio in one sale etc)…..then the negotiators get going (in private sales) or the bidding is done. – Once purchased, you have a team of people (content writers etc) or you utilise outsourcing (already having a list in place) to implement some of those improvements / content plans etc. That’s a little disjointed as I’m pressed for time, but it would be a cool little conglomerate that a small team of *already successful* site / blog flippers could put together. Maybe it’s what the empire flippers mentioned above already do. – The final idea is simply this….in order to fund the operation, and provide opportunity for the so-called, “little guys” you could sell shares in this venture. That takes the risk off for the team that starts it all, and provides opportunity to someone like myself, who – rather than risk $1,000 on one deal without any experience, could put that same $1,000 into a share of this business where I am investing in a number of sites / blogs that have been purchased by experienced site flippers. Great idea Steve – I’ve had something similar before myself and talked to people about it too. I actually think it’s being done in some shape or form, just not publicly talked about on blogs etc. I’m friends with Liz and Matt Raad who invest and teach buying and selling websites. They have a lot of connections with people doing it on much larger scale, including people who are creating portfolios backed with investors. Not something I am interested in doing now as I like the process of teaching and writing, not the managing of sites as much, but definitely viable. Someone like yourself might be able to kick it off and coordinate it – not manage the sites themselves etc…. Is it just me? Various e-commerce businesses I can understand (you don’t care who the owner is, you just want the stuff). Businesses with a certain software etc, no probs. Forums – another one where it’s not about the owner. I think about all the blogs I read at least semi-regularly (hello, Yaro! )…and I cannot think of *even one* blog that is *not* about the person writing the blog! i.e. The whole blog thing is about the authorship. For a “pure” blog. To use the oft-quoted example when using an example in the IM space…take the well known and well loved Pat Flynn. I don’t think he’s actually got a sell-able business(!) Not that he’d probably want to. Bold statement? No. Pat Flynn is a gigantic part of the good will of the business, and without him, you lose that (big) part of the balance sheet (this effecting valuation). A re-branding (which would be necessary) would likely retrograde the income. I’m not saying it has no value. Clearly you could buy it, based on the traffic etc, do the re-branding and do your best to retain many readers. However, I would argue that you’d need to really incorporate that risk into your valuation; and you’d want to have a very well thought out re-branding plan as part of your decision to buy. SPI might be a more extreme example, but I still can’t think of a blog I read on at least a semi-regular basis where the author isn’t centrally part of the value of that blog (aside from a few blogs attached to a broader business). Yes – very pertinent question Steve. When I purchased SmallBusinessBranding.com I was concerned I would lose all the audience that Michael the previous owner had a relationship with. I may have lost about 5%-10% based on the statistics before and after, although I was very careful to introduce myself, state why I was taking over, explain what my credentials and back story and where I wanted to take the site. Shortly after taking over I stopped writing for the site and brought on a team of writers, so it became a magazine blog, which you can easily sell because the value is not so vested in just one individual. One thing you have to be aware of when you take over a blog is that a large chunk of the audience will be new visitors who has no history with the owner. They come from a link or a search result and that’s the first experience they have with the site. Because of this, when you buy a blog you should view statistics on new vs repeat visitors. It’s only the repeat visitors who have a relationship with the owner that is at risk when the transfer happens. On some blogs, new visitors can make up 80% or more of the traffic – so what you are actualling buying is a steady stream of new audience who are interested in a topic, not the person who started the blog. As you state, really large “personal” branded a blogs, like with Pat Flynn’s, or John Chow or Shoemoney, or countless others, the greater the potential risk of loss of audience. Bear in mind there are magazine blogs with multiple authors for sale that you can take over without any disruption. These are like Mashable or Techcrunch, which interestingly enough started off as individually branded blogs (Pete Cashmore and Michael Arrington) but morphed into magazine style. I really believe any blog is a potential good purchase. What’s important is meeting the needs of the audience. If you can do that as you take over and even enhance their experience as time goes by, a blog is a brilliant potential purchase. Incidentally, one of my members in my coaching program just purchased a blog from a woman who writes about how to make money as a woman blogger. This particular coaching member of mine is also a woman and decided she wanted to get into that niche. Finding this website for sale was a big part of the decision, because it gave her an instant platform to start from and grow. Time will tell of course whether it works out, but I suspect things will go well because she is motivated to continue to help the readership. That was a brilliant couple of points, thanks Yaro. Especially that (a) lots of the traffic can come from new visitors (and you want to view that statistic and weight that into your valuation)…and, (b) that it is possible to move into a new blog and morph it (for example) into something more hands off (multiple writers). Really appreciate the many examples you used in your thoughtful comments. I might have to re-consider this blog buying opportunity! Earlier I was on the opposite side of the table. i have sold a couple of blogs in Flippa. But with time, Flippa has become a dumping ground of turnkey websites. It’s really hard to find a website with traffic. Yaro, do you recommend that a person should also buy the email list from the owner along with the website? Most website owners will only sell the website without the audience he has built in the last 3 years. It significantly lowers the overall value of the blog. You need the list for sure – it represents at least half the value of the site, if it is a still responsive list. Yaro, thank you for the service you provide here. I’ve read your work and have an impression that I-a novice with little tech language skills-cannot do this. I would LOVE to have a Blog or website and make additional income. Do you honestly believe someone like me can do this…Successfully? I’d love to try but don’t really have the cash to loose. Again, thank you for great work. Anyone who focuses on helping others solve a problem they desperately want to solve can do it. I’m in the same position you were in when you started out, in university. I am trying to create to a good amount of passive income for myself by graduation so that I can focus on business rather than a job! I am more inclined to buy a website rather than a blog. I was wondering if you have any advice for me start? How updated is your buy a blog ebook? I m considering buying the ebook but need to know if it is the latest updated version. Tx. I wrote it last year and it’s designed to be focused on fundamentals, so I consider it very relevant still Yoshiko. If you don’t feel you get value from it you have my 30 day refund period to protect you. Wow!! That was fast response for a busy person like you! I guess my concern echoes the first commenter, which is if the blog they’re selling is actually making money… then why are they selling it? The reasons I’ve read so far are ‘the owner wants a flood of capital,’ or just losing interest in it and such. But if I had an asset that was making money (like I would hope to gain with the purchase of a blog,) I certainly wouldn’t sell it. So it feels a little weird to trust that it would be as good as they say. I bet if you owned a money making website, but there was this new business opportunity you were interested in, or a car or boat or house you wanted to purchase, or perhaps you have a marriage coming up, or you were just sued and have legal bills to pay, or perhaps a medical or dental bill that just hit you… There are all kinds of reasons a person needs to sell something. All the websites I sold were making money and didn’t require much upkeep. I sold them because I wanted a big hit of cash (at the time I wanted to buy a car and house so I could move out of my parent’s house) and I also was tired of having to think and worry about these websites. I wanted a clean slate, nothing else to think about, and a nice big hit of cash too. I bet if you buy a website and it starts making money there will come a day when you want to sell it too. Hi there Yaro – I recently began a gag gift e-commerce site and got an email from someone in India saying they love my idea and want to start it up in India (I’m in the U.S.A.) Now I’m really not a business expert. The site is very new and so far unprofitable. Is it better to say yes, and draw up a contract getting them started and taking a cut of what they do if they make money? And if so how would I keep them accountable when I’m in the U.S.? Or should I just sell outright if they’re that interested? Hope you can reply soon–We’re in contact now and would love to know your thoughts! Thanks so much.